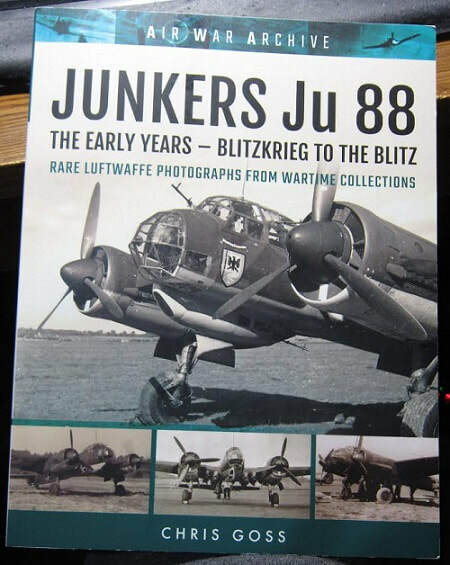 Junkers Ju 88, the Luftwaffe's Most Versatile Aircraft (box art is mostly the same as the book I got. Junkers Ju 88, the Twilight Years, Biscay to the Fall of Germany. Different cover art. The book contains 147 pages in 7 1/2" x 9 3/4" page format. It contains 185 black and white wartime photos, including the ones on the covers. The cover has a large black and white photo of a Ju 88 sitting on a grassy runway. It has a unit badge of a shield with a black eagle on it on its nose. Unit unknown. Below that there are three smaller shots. Also of Ju 88's sitting on grassy runways. The back cover has a black and white photo of a Ju 88 that has crashed and is being observed by two British soldiers. It has a unit marking of a half moon symbol on its nose. Of the photos, one shows Goring and 74 more show pilots and groundcrews around Ju 88's. The unit badges for KG 77, KG 51 and KG 30 are shown. This is great picture album of shots of the Ju 88. Designed as a fast bomber that could out-run the fighters of the era, the twin-engined Junkers Ju 88 became one of the most versatile aircraft of WWII. Such was the success of the design that its production lines operated onstantly from 1936 to 1945. More than 16,000 examples were built in dozens of variants - more than any other twin-engined German aircraft of the period. From an early stage it was intended that it would be used both as a conventional light bomber and as a dive-bomber. As such, it served in the invasion of Poland, the Norwegian campaign, the Blitzgrieg and the invasion of France and the Battle of Britian. It went on to operate in North Africa, form a key part of the air assault in Operation Barbarossa, and was vital to the Luftwaffe's defence of Germany in the face of the Allied bomber offensive. It was also adapted for use as a fighter, night-fighter, torpedo bomber, reconnaissance aircraft and even as a Mistel flying-bomb. It was used effectively against both land targets and shipping. In this unrivalled selection of archive images collected over many years, the opertions of this famous aircrft are portrayed and brought to life, from the beginning of the war, through the Blitzgrieg and the Battle of France, to the Battle of Britain and into a training role. Having retired from the RAF with the rank of Wing Commander, Chris Goss is a regular and highly sought after contributor to major aviation publications in the UK, France and Germany, as well as the author of 25 critically acclaimed books covering the air war between 1939 and 1945. Chris completed an MA with Merit in War Studies in 2001. This book will be of great interest to modelers and aviation enthusiasts alike. I want to thank the folks at Casemate Publishing, the North American distributor of Frontline Books, for this review sample as well as Frontline Books.